North Shropshire Liberal Democrats exist to fight for the traditional liberal values of freedom, fairness and opportunity for all. In an increasingly illiberal society, the role of the Libdems in politics has never been greater. Increasingly battle lines are being drawn between the authoritarianism and liberalism. What sort of country do you want to live in? Or free, open, tolerant, outward-looking and progressive? If you believe in a free, open society, where: individual rights and freedoms are protected; individuals are empowered to be the best they can be; a greener Britain and a Britain that has a strong outward looking voice in the world; then join us. If you demand better than Brexit… join us. If you demand better for the NHS… join us. If you demand better for schools… join us. If you demand better for Shropshire and for Britain… join us. If you feel let down by the Conservatives and by Labour and DEMAND BETTER… join us. Liberal Democrats nationally and in North Shropshire have grown massively since 2016, doubling our membership. We are emboldened and invigorated. We exist to get things done, ensure local and national government works for you and not the other way around. We demand better for Shropshire and for Britain. United means we will always put the interests of the whole United Kingdom first. We reject the divisions in society, whether between young and old, urban and rural, leave and remain, or between regions and nations. We believe we are stronger – as communities, as a country and as a world – when we work together in our common interest. We believe in Opportunity. That everyone, no matter what your background, should have the same chance in life. We want to fight injustice, reduce inequality and break down the barriers that hold people back, whether it is in schools, the workplace or anywhere people are denied a fair chance. Liberal Democrats believe in a country where if you play your part in society you should be able to afford a good home, rely on well funded public services, and get ahead in life. That's not the case today. Britain deserves better. We want to give all our children a brighter future in a fairer Britain where people are decent to each other, with good schools and hospitals, a clean environment and an innovative economy. That starts with a strong and stable economy, fit for the long-term, without which we can’t have a strong NHS, good schools and decent public services, and without those creating opportunity is impossible. We are the only party that combines economic competence with a plan for strong public services and an optimistic vision for a Britain that is open, tolerant and united. Do you want to find out how you can help? There are many ways you can help the Liberal Democrats in North Shropshire. Shropshire Liberal Democrats are the largest opposition group on Shropshire Council, which is currently run by the Conservatives. This is something we want to change. Are you tired of being let down by the Conservatives and Labour? Together we can and will Demand Better. Demand Better than the Conservatives. Demand Better than Labour. Demand Better than Brexit. Demand Better for our NHS and school funding. Demand Better than rising violent crime. Demand Better for the environment. The Conservatives locally are a shower who’s priorities are all backwards. Our roads and services are falling apart. The Conservative administration has a massive ‘black-hole’ in their budget. The Conservatives are wasting millions of pounds we haven’t got on failed projects like IPnE; buying declining shopping centres; refurbishing Shirehall and a 50% pay rise for the Chief Executive. Whilst the Conservatives fail to invest in projects that can generate new money or on green projects like LED streetlights that can save money. The Liberal Democrats are driven by and for its members. 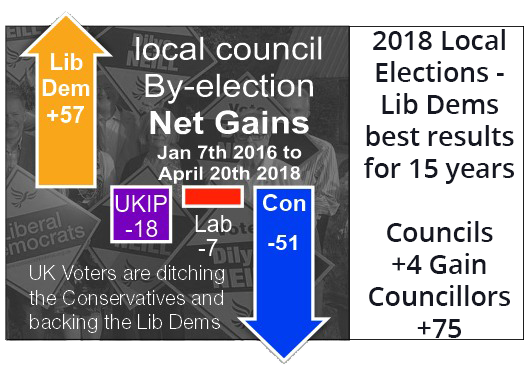 Members of the Liberal Democrats have a much higher level of influence in our party than the other main parties and have a direct say on party policies and can even propose policies which get adopted by the party nationally. Elizabeth Jewkes famously got the party to adopt lowering the income tax threshold as party policy, which then was on the front of the 2010 manifesto, that then became law under the coalition government and cut thousands of people out of paying income tax altogether. Many things are happening locally in North Shropshire that doesn’t always appear here or on Social Media. To keep up to date with news, campaigns and events Sign up for our Email Newsletter at the bottom of the page. Through the year and between elections the Lib Dems are out and about grafting for people like you. This is reported back through regular Focus Newsletters which are delivered for free by volunteers. If you would like to become a deliverer contact us to let us know. Delivery can be as much or as little as you like but it generally takes an hour or so to deliver 100. Unlike the other main parties, we don’t have a stable of media barons to back us, rich donors or the trade unions to fund us. So Liberal Democrats rely on volunteers and the support of their members and supporters. Every penny raised goes to get more and more Lib Dems elected and our policies implemented. If you would like to make a donation please get in touch with us or you can donate via the national party website. Just like a donation but with a chance for you to win a fantastic prize in the process. Prizes like a £2,000 holiday voucher, in time from Christmas?! That’s just one of 30 prizes in this year’s Lib Dem Christmas Draw – tickets on sale in the autumn. 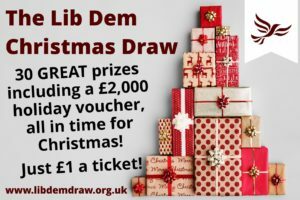 Buying Lib Dem Christmas Draw tickets online at https://libdemdraw.org.uk/north-shropshire not only gives you the chance to win yourself a great gift for Christmas but also raises funds for our Lib Dem campaigning here in North Shropshire too. Often the simplest things you can do to help is by joining. You will find that we are a friendly and supportive party. We value all of our members. Your opinion matters and developing your ideas is actively encouraged. Contact us for more information on how you can help us fight for a brighter future for Britain and North Shropshire. Since the 2015 General Election, our membership numbers have doubled, Nationally and locally in North Shropshire. Membership is at record levels and we are far more active on the ground right across the country. Help us fight for a brighter future for Britain and North Shropshire – Join the Liberal Democrats in North Shropshire or become a supporter. “I joined after the EU referendum result. After the result I saw our country heading in the wrong direction. Our country is at its best when it is an open, tolerant and united country. I felt it important that I got involved to help fight for those Liberal Democratic values. My first hands-on experience was being part of the amazing team who helped win in the Richmond Park by-election. 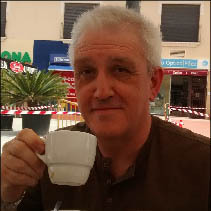 Since then, I’ve joined the welcoming local party, stood as a candidate for Shropshire Council and Oswestry Town Council.” Often the simplest and easiest way to help the Liberal Democrats is by joining the party. If you did no more than that we would be very grateful. Many members are active campaigners on local issues that impact on us all every day. No all members take that step and that is OK. If you did then you can be assured that you would have plenty of training and support. If you would like to join it isn’t expensive and is best done via direct debit. Membership is from as little as £1 per month or £12 per annum. 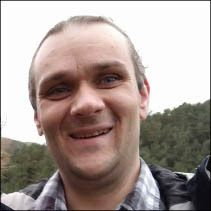 Why should I join the Liberal Democrats? There are lots of reasons to join the Liberal Democrats. Some people joined us because they wanted to stand up for our values, of openness, tolerance and unity, Some because they want to help us win elections, others so they could stand for election and stand up for their community. Tens of thousands of people have joined our party in the last two years and our fantastic members, new and old are the lifeblood of our party. They’re what’s driving our party’s fight back and they will ensure that Britain always has strong, liberal voices, working to build an open, tolerant and united Britain. 1 Help us stand up for our values and build a Britain that is open, tolerant and united. 2 Direct and advise on our Party’s manifesto for the next General Election, whenever it comes. 3 Pick your local candidates for council and Parliament. 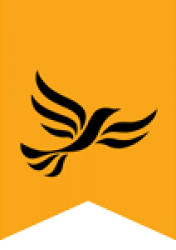 4 Stand for election as a Liberal Democrat Councillor or MP. 5 Access exclusive members-only events and training. 6 Attend conferences at national and regional level.